If you read our enlightening “how to switch to LED bulbs” tutorial, you’ve hopefully already seen how much money and energy you can save by replacing your incandescent bulbs, but we wanted to make it even clearer how easy and effective a home light bulb makeover can be. We headed over to Brooklyn to give a light bulb overhaul to the managing editor of Inhabitots, our very own Julie Seguss! Julie is going to be a new mom in just a few months, so saving money is of the utmost importance right now, but she still wanted to keep her Park Slope home illuminated with a warm, bright glow. In just a few hours, the Inhabitat lighting makeover crew (aka Inhabitat editors Jill & Yuka) were able to swap out all of Julie’s electricity-guzzling incandescents and halogens with energy-efficient Philips LEDs, and we think you’ll be impressed with the monthly savings we tallied up for Julie at the end of the day. Check out our video above to see the whole makeover, and find out how much extra cash Julie and her husband will have after the makeover to spend on diapers and baby clothes! Julie and her husband loved the overhead lighting in their beautiful home in Park Slope, Brooklyn, but they noticed that their electricity bill was quite pricey every month. With a new baby coming in just a few months, they hoped to cut back on whatever expenses they could, and swapping out incandescent and halogen light bulbs with LED bulbs is an easy way to effortlessly and automatically save money on your energy bill every month. Contrary to the old stereotype, the latest generation of high tech LED light bulbs can be just as warm and bright as incandescent bulbs, so unlike other makeovers, the point of our lighting makeover was to show that Julie couldn’t see a noticeable difference with her new lights at all — that is, until got her next energy bill and saw how much money she would be saving! Julie’s spacious living room and kitchen are filled with sunshine during the day but at night, it takes 11 75W halogen flood bulbs to light up the space. 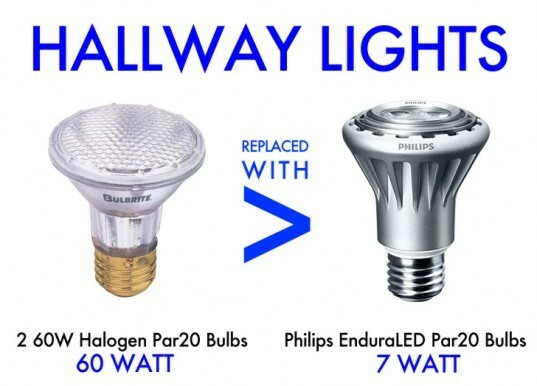 Luckily, it didn’t take much elbow grease at all for Inhabitat editor-in-chief Jill Fehrenbacher to swap out those energy-guzzlers with 11 12W Philips Par30 LED flood bulbs. As you can see in the video, Julie’s very pleased with the result and the amount of money she’ll save with this simple switch. Though you might not pay much mind to them, your hallway lights can really add to your monthly electricity bill if you’re using halogens or incandescents. We didn’t want to ignore this small space in Julie’s home because there are savings to be found there (at least enough for a few new bottles or swaddles). We swapped out her 2 60W Mini Halogen Reflector Bulbs and replaced with 7W Philips Par20 LED Flood bulbs for a savings of $21.84 per year. Next we moved to Julie’s bedroom, office and bathroom, where we swapped out 15 60W incandescent light bulbs with equivalent brightness Philips 12.5W AmbientLED replacement bulbs. Julie also expressed to us that she wished she had more light in her bedroom so we swapped out the two 60W incandescent bulbs in her ceiling sconce with 17W Philips AmbientLED Bulbs (75W replacement bulbs) to provide her with a lot more light. Even though these bulbs use just 17W of electricity, they provide light that’s as bright as a 75W incandescent bulb, so now she’s getting a lot more light with a lot less energy! We also gave her two bright new yellow table lamps from West Elm to create a cheery (and matchy) new space. The total energy savings between bathrooms, office and bedroom is $208.76 per year. HOW MUCH WILL JULIE SAVE ALTOGETHER? So now for the moment of truth – how much will Julie save after our lighting makeover? We swapped out a total of 11 halogen and 17 incandescent bulbs in Julie’s house and her total annual savings (based on the cost per kWh noted on her past energy bills) comes to $411.36! Now, that’s a lot of diapers! Don’t forget to watch a video of the whole makeover above and click through a photo gallery for a play by play of our favorite highlights of our video shoot. And if you have a baby on the way or would just like to save some extra money on your monthly energy bill, don’t be afraid to try your own lighting makeover! That’s a lot of diapers for Julie’s new bundle of joy! Inspired to make the switch from incandescents to LEDs in your own home? Check out our How to Switch Your Bulbs to LEDs To Get Ready for the Incandescent Bulb Phase-Out tutorial here. @ PatriotGunny The reason they are not using the pyroelectric effect is two fold - first is cost. The cost that it would add to the bulb is more than the cost of the electricity it would save over the lifetime of the bulb. Second, adding extra components to the bulb takes extra space that is not currently available. 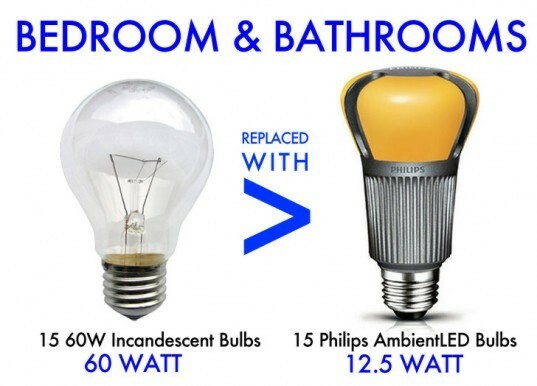 LED bulb lifetimes are directly correlated to the temperature at which the bulbs operate. Currently engineers are just capable of sufficiently extracting heat from the bulb to make it's lifetime acceptable. While these nano-generators would extract heat as well, they would not extract as much heat as the heatsink, or part of the heatsink, that it would have to replace to stay within space requirements. @Gang Green - While I am quite happy that you made the switch to LED, and I do advocate switching to LED for those who can afford the upfront cost, I do have to make some corrections to statements. First, while CFLs had poor light quality to begin with (and many of these cheap, low quality bulbs are still for sale) they have improved drastically in recent years to the point that they are comparable to incandescent bulbs of the same light temperature. "they don’t work well outside until they warm up" - again an issue that has been fixed for newer bulbs in all but the coldest climates. If you live in a location where temperatures are regularly below zero, LEDs may make more sense. Breakage - I can't refute this with numbers, but I personally have never broken a CFL bulb, so I do not understand where this comes from. Cost effectiveness - NO LED currently on market is cost effective to CFLs unless you are paying over 20c/kwh. The best supply of CFLs I have found is the 18 pack of 60W equivalent bulbs for $27 at Home Depot. Good quality, instant on, cost effective, power efficient. I hope to be saying the same thing about LEDs soon, but as of yet I cannot. I do have to agree with you on the dimmer though - if you are using dimmers absolutely go dimmable LEDs. I do not mean to start a debate or anything of that sort, but as I am an Electrical Engineer with a some-what extensive background on the topic I do feel the need to prevent the spread of mis-information when I can. I do applaud your switch to all LEDs though. Also, on the 950W of cooling power saved - that is not accurate either. First, you would have to be running those lights constantly for that amount of heat to even be generated, and it's largest effect would only occur during the peak of the day when cooling costs spike - which also happens to coincide with when lights are turned off. Second you point about expelling the heat is not accurate. As AC units are heat pumps that have a heat transfer efficiency greater than 1 (not total efficiency!) it takes substantially less than 1KW of power for an AC unit to remove 1KW of heat. Actual numbers may very, but all current heat pumps have better efficiencies than this. One thing that has been left out of the conversation is the heat that incandeescent bulbs create. The reason a 12.5W LED can product the same amount of light as a 60W incandescent is that the remaining 47.5W goes to heat production. If you change, say, 20 of these bulbs out, you have effectively turned off a 950W heater in your house. In the summer this would save you >950W in energy to cool your house (assuming your HVAC is not 100% efficient) . . . or would let you just leave the windows open, instead. As an aside, the reason LEDs have big heat sinks has to do with the facts that a) they cannot dissipate heat as well as incandescents and b) they do not tolerate heat as well - it is not because they produce more heat. CFLs are horrible - I tried to love them, but could not. Quality of light is poor, the lifespan always fell WAY short of what was promised, the dimming was marginal, they don't work well outside until they warm up . . . and then there is the issue of breakage - which is easy to do. Now I have all LEDs and LOVE them. They dim further than a side-by-side incandescent, have better quality of light, are on instantly, work outdoors in cold weather, and are neearly impossible to break. They also do not get as hot as CFLs, and lose the bulky ballase, coiled tube, etc. Now that I have LEDs, I wonder why I ever bothered with CFLs. Having said all of that, YES - LEDs are cost effective relative to CFLs. Obviously the payback is slower than it is relative to incandescents, however. Still - LEDs are worth every single penny! I wonder what will happen to LED lamps after they burn out. Discarding an LED lamp or recycling it with other electronics would be wasteful. I believe that LED lamps have the potential to be designed so that the LED module or the ballast can be replaced. Consumers could bring their burned-out LED lamps to a retailer and get a discount or rebate on a new lamp. The retailer would send the burned-out lamps to a repair center to be refurbished. Even if a repairable design is not feasible, the heat sink could be separated and reused. It would make no sense to melt it with other scrap aluminum. Some of the earliest compact flourescent lamps, by the way, consisted of a U-shaped tube that plugged into a ballast built into the fixture or plugged into an adapter that screwed into a standard socket. This is a more sustainable design for CFLs, I believe, than what is now on the market. Unlike most CFLs, however, many LED lamps are made to be dimmable, but their lower wattages make them somewhat incompatible with the common 600-watt dimmers. To get optimal dimming, I highly recommend a dimmer that is designed for CFLs and LEDs. I know that Lutron sells them, and they're available at hardware stores. So I'm curious what the difference in savings would be if you used CFL bulbs? This whole thing just seemed like a fancy ad for Philips light bulbs. I switched out all the lights in my house to CFL for half (or sometimes a quarter) the price of the LED lights and I cut my energy bill in half. Anyway, I was just curious. @ebsebs - my calculations for this article were all correct. When I was interviewed in the video saying that "12.5W LED bulb uses 15% of the energy of a 60W incandescent bulb" I was just speaking off the cuff, and trying to do a quick/rough calculation in my head, off the cuff - and clearly I was a little bit off, but there isn't a huge difference between 15% and 20% - it was just a guestimate at the very beginning of the video shoot. Please understand that it took us several days to shoot and produce this video, and my talking about LED bulbs in the general sense and making guestimates about energy savings happened at the beginning of the shoot, and after that initial interview my team and I went and calculated all of the energy savings for each fixture in Julie's house, based on 3 hrs of use per day, $.24/kWh - 11 Par30 Halogen Recessed Can fixtures + 17 60W Incandescent fixtures. Hi Jill: Sorry it's been a few days, but I was out of town all last week. To answer your second question first, I'm in North Carolina. To answer your first question - here is my work: My power cost: $.107/kWh Your projected savings (Bed/Bath): $208/yr -or- $1.16/month/bulb -or- $.0385/day/bulb (assuming 30 day month) 60W bulb = $.00642/hr of use (@ $.107/kWh) 15W bulb = $.00161/hr of use (.00642 - .00161)x = .0385 <---solve for x x = 8.00hrs/day Now, since your power is a bit more expensive, you'll reach your savings much quicker than I will. But, still, that requires turning on every single light in the house for 3 hours. I typically only use lights in the rooms I'm in. And, even then, I don't usually use every single light in the room. Not only should you check your dimmers to see if they will work, you also need to watch how many LED bulbs you use on a dimmer. I have LED lights in my kitchen that say no more than 5 per 600 watt dimmer even though the lights are only 14.5 watts each, the reason is because the in rush current can exceed the dimmer rating if you use too many. LEDs do get hot and require heatsinks, but the heat is very concentrated compared to light bulbs, and is far less than lightbulbs. Put a 60w incandescent next to an LED equivalent, put your hand over them and you will see that the overall heat is less with the LED. Thank you for this, as I was waiting for more positive stories on the LED switch. And you should make those taking the plunge, aware of the upfront costs (bulbs are half the cost what they were 1-2 years ago, and will still drop in price), so that yes, you will save $400 or more the first year in energy, but your ROI (return on investment) may take two years or more (depending on how many rooms you have, and inside/outside lighting..that $22 LED cost me $45 last year). You could also point out that it might require checking with a good electrician as some LED lighting requires special dimmers than the ones for incandescents. And some LEDs still can't compete with the "sunlight" temperature* for winter blahs (they have grow LEDs that are really UV/Red/warm leds in an array--but are for plants). (*Important for anyone with Post-P depression) Do you know why LEDs have such a large heatsink (making them heavy)? Unlike an incandescent, which generates heat away from itself, the LED cannot exhaust its heat away. So manufacturers have devised a method to have the LED almost directly on the heatsink to help wick away the heat. If it didn't the LED will eventually fail. Some green folks can make the argument that the energy needed to make the LED lamp and heatsink exceeds the cost of the incandescent lamp. I've had the Phillips LED (looks like a yellowjacket tail) since its release and it looks amazing in a stained glass lamp (no one knows its an LED). Take the shade off and holy cow, is it bright! But, what is amazing with LEDs is that you need to rethink lighting. Why not the baseboards, moulding, lightswitch bezels, trim, walls, shelves become the lightsources? 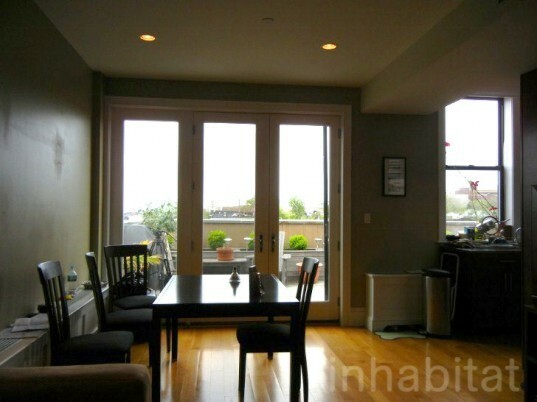 Why are we not seeing more DC home conversions for lighting? I've put illumination under my desk, my keyboard drawer (LED tape strips) that provide a new source of lighting without affecting the room (and use little energy). I prefer the Phillips and Sylvania bulbs. There was an "earth" LED bulb sold at HomeDepot that I now avoid...three failed after a year (and I barely used them). Also, finding a bright, candelabra lite for the newer ceiling fans has been a thorn (seems ceiling fan makers made a switch to smaller bulbs...and they only go to 40Watts...I used to have a pair of 60W halogens in my previous Hunter fan...replaced the fan with another Hunter (after 10 years it got really loud) and they changed the lighting to smaller bulbs...and these were dimmable. Lastly, as long as you use the LED like previous lighting, you can save $. But beware that knowing that LED uses 1/4-1/10 the energy, you might tend to leave it on more. I know I leave the 11W (75W equivalent) PAR30 in the kitchen on more than I used to. For those building newer homes, and wanting to be less dependent on the local power company, get a green-friendly architect to help plan and design your home. @Otis11 you're dead on. In illinois, power runs near 7 cents/kWh. I'll be paying 4.5 cents/kWH for the next two years shortly. Only thing that pays off in that scheme is CFLs and that's if I get them cheap. Luckily the Ecosmart CFLs are occasionally subsidized down to 4/$1 at Home Depot so I loaded up on those. I would need current LED bulb costs to drop to 1/3 of what they are to really justify the expenditure. I'd love to see the math on your savings example. While I don't disagree that there is great savings in LED lighting (I founded a company on that premise) I think it is very difficult to get a good return on your investment in a house. The problem with most people's calculations is they assume the lights are on 8 hours a day (or longer) when in truth the average residential lightbulb is on less than 3 hours a day. A home office or kitchen area generally make sense but hallways, bedrooms and bathrooms are rarely lit. Overall a great article. I wish you would have discussed your costs as well as savings to put it into better perspective. I've already bought a few LED bulbs, but some of the first ones(Sams Club, which no longer carries them) were nowhere near as bright as they claimed, and didn't last very long. I've also bought a few from overseas that were much cheaper than the Philips ones. I do understand that it is a good investment to replace with LEDs, but it will be an even better investment to wait another year or two when the prices are even lower. Meanwhile, I use them in my highest use lights. I'm also building a small solar PV system to run 12 volt LEDs that ar more efficient and cheaper than 110 volt AC lights. One more thing, TreyWaters, your local power rate is less than 1/2 of what Julie's is in Brooklyn. Yours is $.107/kWh and hers is $.24/kWh. Where do you live that electricity is so cheap? TreyWaters- all of these energy calculations we did for Julie's makeover were based on 3hrs of use per lightbulb, per day (7pm -10pm). That is all. Show me your math, and I'm happy to share mine. Jane, are you just looking to scold someone? Seriously. Of course I would think that most people would take their $22 LED bulbs with them when they move. However, I also recognize that not all apartments / houses are the same, and if people move from a space that has 11 recessed ceiling can lights (like Julie's place) to a place where they have none (I have no recessed ceiling lamps in my apartment), then they're not going to be able to take those Par30 bulbs with them. Different lights require different lightbulbs and not all homes are the same. I'm just trying to help consumers do the math and understand how quickly their investment in better bulbs will pay off. Do people really leave their lights on all of the time? That's the only way I can really see someone's actual savings matching up to your calculated savings. For us, our Winter power bill (in other words, not running the A/C) is about $60 per month. Take out everything else that runs (TVs, ovens, alarm clocks, cell phone chargers, etc. ), and I would estimate we use up to $20/month on lighting. This includes 2-60w bulbs to light our living room (20'x20'), 6-60w bulbs in each of our bathrooms, and 3-ways on our nightstands. This doesn't count overheads in each room, just the lights we use most often. However, we only usually have lights on when we need them. In fact...I just calculated the time it would take to net the savings quoted in the Bedroom/Bathroom section above (granted, using my power rate at $.107/kWh). Just for the Bedroom/Bathroom figure, it would take 8 hours of burning every single light replaced to net the savings quoted above. Do people really come home and turn on every single light, and leave them on all evening? If not, it's hard to see how these figures will be reached, meaning payback is MUCH longer than the quoted 1.5 years. 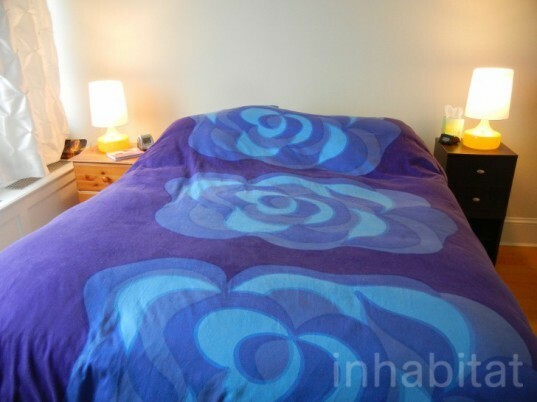 .." Worthwhile.. if you're going to be in yr apartment more than a couple of years" Shame on you Ms Fehrenbacher ! I thought this was about a responsible life style. Sometimes we have to put our money where are mouths are...and take the bulbs if you move? Some city's also have rebates when you purchase LED bulbs so you can save some money on upfront costs that way! Hey Thrhymes- Each of the Philips bulbs is about $22-25, so, yes, the up-front costs are not cheap. Total bulb costs were around $600, so it will take Julie 1.5 years to recoup that upfront cost (if she had bought the bulbs herself), but she'll be making money back after the 2nd year. I guess my point is: this is worthwhile to do if you're going to be in your apartment or house for more than a couple years. If not, probably not. i have to ask: how much did the pulbs cost all together?? I converted bulbs in recessed can lights in my kitchen and went from 440 watts to 62 watts and the light is better and dimmable. I also converted the track lighting in our basement office to 10 7 watt LEDs and split the circuit so when only one of us is using the office we can light up just our desk and its only 35 watts, but the lighting is still excellent. Home Depot has a good selection of LEDS in addition to Phillips. It's amazing to see the environmental (and economic) impact that switching all of the light bulbs in a house can have! 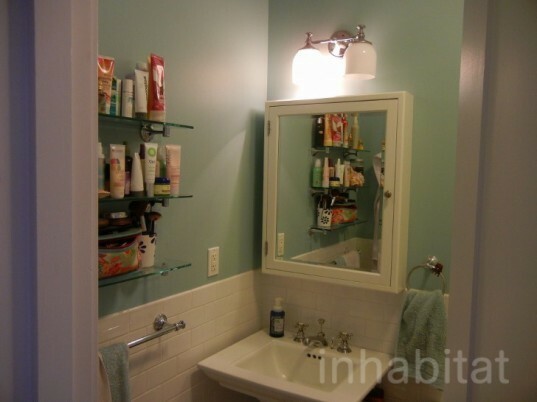 She saved over $400 just by swapping out her light bulbs? Awesome! a single bulb doesn't seem like much, but adding together the impact of a house full of swapped bulbs makes you realize how much money and energy is being wasted with incandescents. We headed over to Brooklyn to give a light bulb overhaul to the managing editor of Inhabitots, our very own Julie Seguss! Julie is going to be a new mom in just a few months, so saving money is of the utmost importance right now, but she still wanted to keep her Park Slope home illuminated with a warm, bright glow. In just a few hours, the Inhabitat lighting makeover crew (aka Inhabitat editors Jill & Yuka) were able to swap out all of Julie's electricity-guzzling incandescents and halogens with energy-efficient Philips LEDs, and we think you'll be impressed with the monthly savings we tallied up for Julie at the end of the day. Julie and her husband loved the overhead lighting in their beautiful home in Park Slope, Brooklyn, but they noticed that their electricity bill was quite pricey every month. Inhabitat Editor-in-Chief Jill Fehrenbacher shows Julie a Philips AmbientLED that will replace the energy-guzzling halogen lights in her kitchen. Jill and Julie head to Home Depot to search for new energy-efficient LED bulbs . Jill and Julie choosing which LED bulbs to purchase. Using Jill's lighting expertise, they make their light bulb replacement decision. 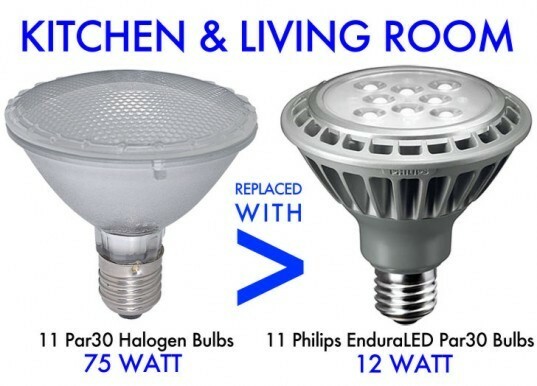 Jill compares the halogen Par30 bulbs in Julie's kitchen with the more energy-efficient Philips Par30 LED bulbs she plans to replace them with. Jill changes out an old halogen for an efficient Philips LED replacement we purchased at Home Depot. Julie's spacious living room and kitchen are filled with sunshine during the day but at night, it takes 11 75W halogen flood bulbs to light up the space. 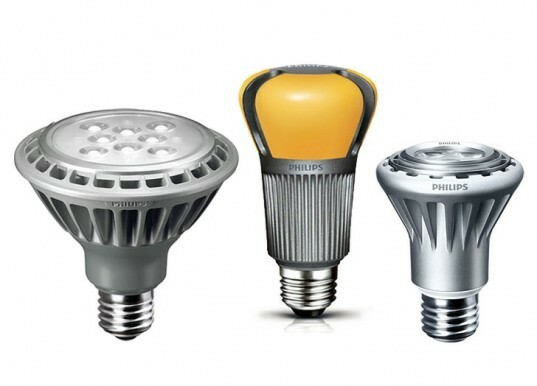 Luckily, it didn't take much elbow grease at all for Inhabitat editor-in-chief Jill Fehrenbacher to swap out those energy-guzzlers with 11 12W Philips Par30 LED flood bulbs. As you can see in the video, Julie's very pleased with the result and the amount of money she'll save with this simple switch in her living room and kitchen. Though you might not pay much mind to them, your hallway lights can really add to your monthly electricity bill if you're using halogens or incandescents. The Philips Par20 AmbientLED we used to replace the halogens in Julie's hallway. We didn't want to ignore this small space in Julie's home because there are big savings to be found there (at least enough for a few new bottles and swaddles). Contrary to popular belief, LED lights can be just as warm and bright as incandescents, so unlike other makeovers, the point of our lighting makeover was that Julie couldn't see a difference with her new lights at all - until she looked at how much less she paid on her next monthly energy bill. We did want to punch up the fun factor a bit though so we did give Julie's bedroom a little extra pop with two new matching yellow lamps. Julie's bedroom before the makeover - mismatched lamps and energy-hogging incandescents. We swapped out the light in Julie's home office and it looked just as bright as it did when it was lit by an incandescent light. Julie shows Jill her office, which was being lit by incandescent bulbs. We swapped out the 60W Standard Incandescent Light Bulbs in Julie's office with 12.5W Ambient Leds. The bathroom was also not doing so well in terms of lighting and was being lit by 2 60W Incandescent bulbs in an overhead ceiling sconce. We swapped the incandescent bulb in Julie's bathroom out for a Philips 12.5W AmbientLED. The incandescent bulbs that were lighting up those rooms just weren't cutting it so we swapped out two of her overhead 60W Standard Incandescent Light Bulbs with 17W Philips AmbientLED Bulbs. That's a lot of diapers for Julie's new bundle of joy! Even Julie's dog Leo was excited about the makeover - though he didn't quite express it.